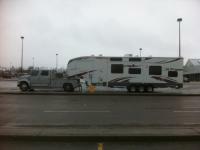 Its a really nice truck and I love it however we are looking at switching to a HDT for the sleeper / comforts. I would never hesitate to buy the same truck again if our needs change. Im hoping it goes to someone that will take good care of it as I did. 5 speed allison , with economy mode, not sure on the axle ratio... i can cruse around 60 - 65 mph and easily get 10-12 mpg very fuel efficient truck. The truck is 275 HP and 650 torque. I haul a 42 foot toy hauler which is 18,000 lbs loaded. Hi I am looking for a mid height HDT with a sleeper.... Preferable a volvo 630 or 730 but open to other options. Please pm or preferably email me kgarwasiuk@shaw.ca if you might have something available hopefully close to British Columbia Canada, but willing to travel for the " right rig" Thank you.